The Taklamakan Desert, also known as Taklimakan and Teklimakan, is a desert in northwest China, in the southwest part of the Xinjiang Uyghur Autonomous Region. It is bounded by the Kunlun Mountains to the south, and the desert Pamir Mountains and Tian Shan to the west and north. 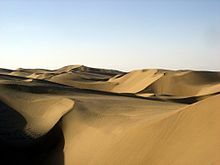 The Taklamakan Desert Ecoregion is a Chinese ecoregion of the Deserts and xeric shrublands Biome. There is very little water in the desert and it is dangerous to cross. Merchant caravans on the Silk Road stopped for relief at the thriving oasis towns. The key oasis towns, watered by rainfall from the mountains, were Kashgar, Marin, Niya, Yarkand, and Khotan to the south, Kuqa and Turpan in the north, and Loulan and Dunhuang in the east. Some of these are now ruined cities in sparsely inhabited areas in the Xinjiang Autonomous Region. The present population consists largely of Turkic Uyghur people. ↑ Spies Along the Silk Road. Retrieved 2007-08-07. ↑ "The Silk Road". Retrieved 2007-08-07. ↑ The Silk Road: Trade, Travel, War and Faith. Retrieved 2007-08-25.